The first Stud event of the 2012 World Series of Poker, Event #4 $1,500 Seven Card Stud Hi-Lo 8-or-Better, concluded early Friday morning after the final 23 players of a 622-player field returned on Thursday to play down to a winner. To say the field was stacked would be an understatement, as evidenced by the list of players you can find below. At the start of the day, all eyes were on Mike Sexton, who was looking to improve upon his runner-up finish in this event last year. Unfortunately he was on a short stack and was unable to make a comeback. In what would be his last hand, it appeared Sexton brought it in for the full 8,000 only to have Michael Mizrachi raise to 16,000. Sexton made a hesitant call and then check-called a bet on the turn. Mizrachi took the lead on fifth street and led out, putting the pressure on Sexton and his stack of 23,500. The latter thought for a minute before committing himself and Mizrachi called. Sexton held a pair of sevens and needed help to overcome Mizrachi's jacks. Unfortunately for him, neither sixth nor seventh delivered salvation and he was eliminated in 15th place. As you can see Marsha Waggoner, a member of the Australian Poker Hall of Fame, ended up being the final-table bubble girl after being eliminated at the hands of Yarron Bendor. It happened after Bendor bet fifth street and Waggoner raised. Bendor raised again, and the call put the lady all in. She was in trouble, as Bendor had started the hand rolled up. Interestingly, Zeidman began the final table as the chip leader, the same feat he accomplished in this very event last year (he went on to finish sixth in that tournament). Zeidman was obviously intent on finishing better this go around as he was mixing it up early. The first elimination at the final table came in a three-way action pot between Mizrachi, Bonnie Rossi and Zeidman. The lady was doing the betting when we joined the action on fifth street. Call-call. On sixth, Mizrachi bet his pair, and that was called in both places, too. Mizrachi bet dark before seventh street. Rossi called all in for her last 20,000, and Zeidman called too. Mizrachi revealed / , and his set of deuces earned him the pot and sent Rossi home in eighth place. Not long after, Xuan Liu brought it in and cleared the field all the way around to Todd Brunson, who completed. Liu made the call and then bet out after Brunson checked the turn. The latter made the call before check-raising all in for just 3,000 more over Liu's fifth-street bet. Liu was ahead with her pocket pair of nines, and Brunson was looking for some help to keep his tournament hopes alive. Sixth street gave him a low draw, but seventh neither completed it nor gave him a high. Brunson took home $22,142 for his seventh-place finish. It took a while for the next elimination but it came when Mizrachi had the bring in and faced a completion raise by Liu, who started the hand with just 37,000. Mizrachi quickly raised and Liu called off. Liu managed to take the lead on fifth street, but it was short lived as Mizrachi stole it back on sixth. Seventh was no help to Liu and she finished in sixth place for $29,985. Upon returning from the dinner break, Bjorin had the bring in and saw Mizrachi complete. Both Zeidman and Bendor came along for the ride, Bjorin put in the extra 18,000 and it was four-way action to the turn. Bendor was first to act and checked, opening the door for Bjorin to bet. All three other players called and it was still four-way to fifth street. Again Bendor checked and Bjorin bet, but this time Mizrachi woke up with a raise to 100k. Zeidman and Bendor got out of the way, Bjorin put in a three-bet and Mizrachi called off his last 28,000. Mizrachi was ahead with a pair of tens, but Bjorin picked up low and flush draws on sixth street. The dealer dealt the last card and Bjorin immediately showed that he had made both. Mizrachi knew whatever his last card was wouldn't save him, but he flipped it up nonetheless before making his exit in fifth place. It took a long while for the next elimination to occur, but happened when Bjorin brought it in and then called Bendor’s completion. The turn saw Bendor bet and Bjorin call, and then fifth street gave Bjorin the lead. He led out, prompting Bendor to say, "I need miracles," before calling off his last 30,000. Bjorin improved to two pair on seventh, and Bendor knew he was drawing dead even before looking at his last card. From there, Brandon Shack-Harris had a rough go as he dwindled to just 170,000 before completing Bjorin's bring in. The latter raised it and Shack-Harris moved in for just 10k more. Bjorin failed to improve upon his pocket tens as the streets flew by, but it didn't matter as Shack-Harris didn't improve either and exited in third place. Zeidman took a nearly 3-1 chip lead into heads-up play, which turned out to be a lengthy affair. Bjorin managed to even the stacks at one point, but eventually Zeidman grinded his opponent down before delivering the knockout blow. 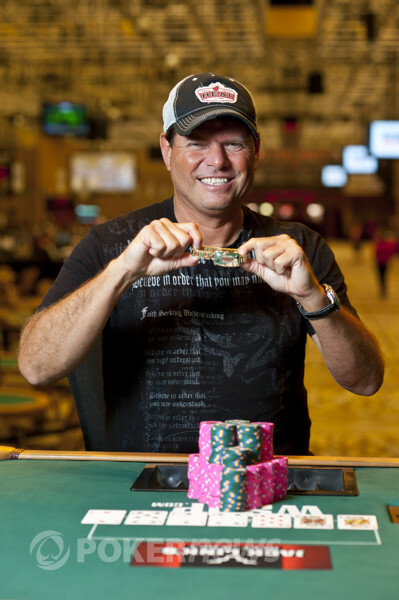 For the second year in a row Zeidman began this event’s final table as the chip leader; however, this year he was able to find redemption and claim his first WSOP gold bracelet. It's all over. 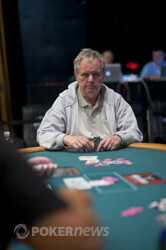 One hand after his crippling, Chris Bjorin has succumbed to Event #4. With just 75,000 left after paying the ante, Bjorin went ahead and got it in on third street with the . Cory Zeidman was showing the , but he was stronger than he looked. "I have pocket kings," he announced. "I'm in very bad shape," Bjorin acknowledged. By the time the last card rolled around, Zeidman's kings were still in front. Bjorin needed a nine to make his straight to stay alive. He went ahead and rolled his card over first. It was the , a blank. Zeidman threw his arms up in the air in celebration, and his river was irrelevant. 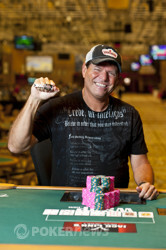 Two-time bracelet winner Chris Bjorin will have to wait for number three. He put on another fine performance here this week, but his run to the title has come up just one spot short. Chris Bjorin fired out a bet on fifth street and Cory Zeidman made the call before both men checked sixth. When the final card was dealt facedown to both players, Bjorin bet, Zeidman raised and Bjorin called, leaving himself less than 100k. "Flush is good," Bjorin said with a hint of resignation in his voice. The action has once again ground to a screeching halt. Nearly every pot is ending on third street, and we haven't seen seventh street in quite some time. The two players are having a good time, though, wide-eyed and somewhat talkative considering it's moved past 3:00am here in Las Vegas. The structure sheet says we'll be here until we crown a champion; we might be in for a long haul. Cory Zeidman brought it in with the , and Chris Bjorin completed with the . Zeidman called, and off they went. Bjorin bet fourth street, then checked and called bets on fifth and sixth. Zeidman's final bullet went uncalled, though, as Bjorin ditched his seven cards back into the muck. A little more traction for Bjorin to close that last level. The two finalists are taking just a quick five-minute break. Matt Chang just showed up on the rail with a cocktail in his hand. "Over/under on a 5:10am finish?" he asked the players. Floorman Brian piped up first: "Under!" Chris Bjorin wasn't so sure, though. "Is there a breakfast break?"